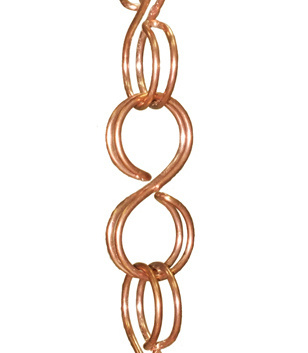 Rain Chains are standard 8.5 ft.
Our 100% Copper Rain Chains are a fun, fashionable and extremely functional alternative to ugly downspouts and will enhance the beauty of your home. 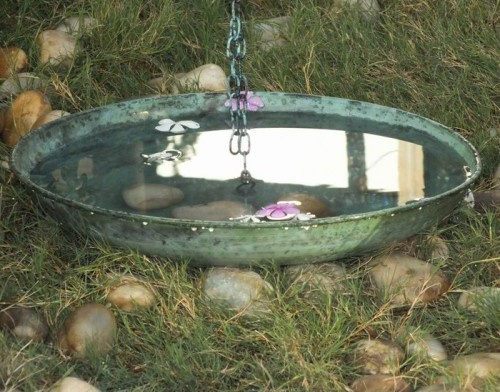 Family, friends and neighbors will enjoy watching rain water cascade down your Rain Chain while listening to the pleasant and soothing sounds. Everyone loves them and they make great gifts year round. Come winter in the North – Don’t Worry! 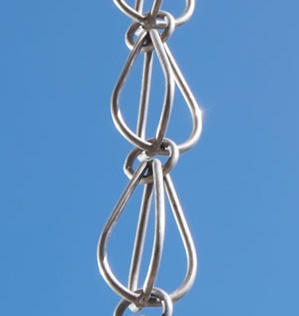 Rain Chains look beautiful covered in snow. 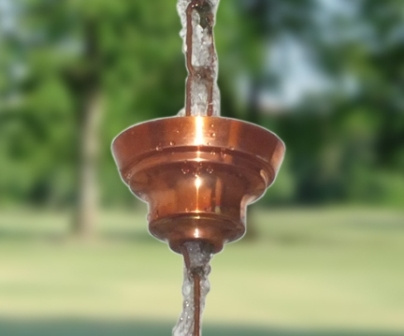 Ice formations will be ever-changing as the sun warms the Rain Chain during the day and re-freezes at night. Weight is not a problem. 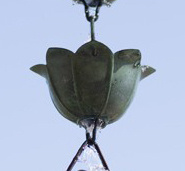 Rain Chains hold a limited amount of snow and ice and never get heavy enough to affect your rain gutters. 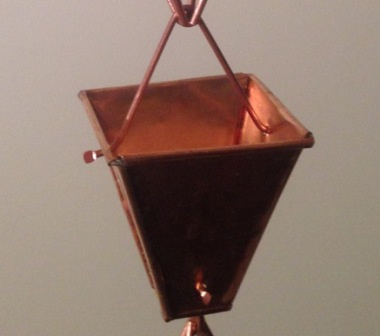 When purchasing a Rain Chain make certain it is 100% copper. 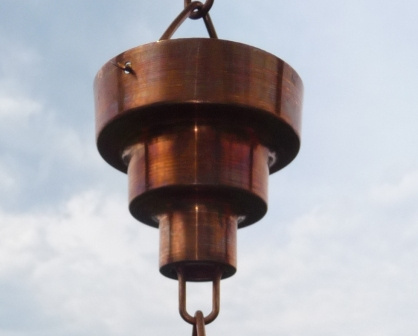 Don’t be fooled by copper plated Rain Chains – They will fade and rust within a couple of years. 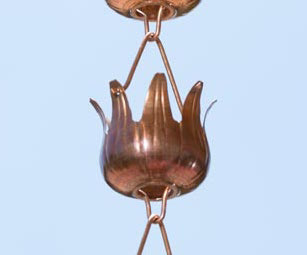 RainChainsStore sells only 100% copper Rain Chains and a select variety of Aluminum Rain Chains . 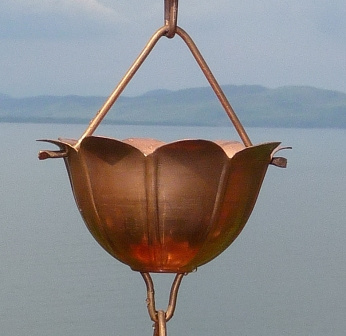 Copper Rain Chains will never rust! 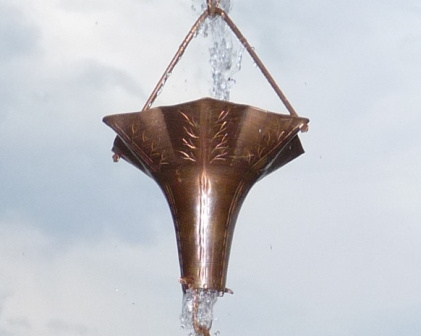 Overtime your beautiful Copper Rain Chain will develop a lovely patina and since we only use 100% Copper your Rain Chains will last a lifetime. 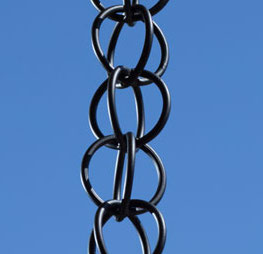 Our website has a great deal of information about Rain Chains. 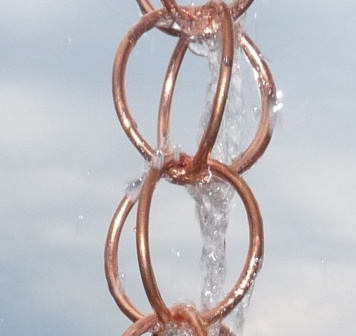 Hit any of the links above and you can learn about the history of rain chains, why use copper, the different styles and why every home can benefit from using rain chains. 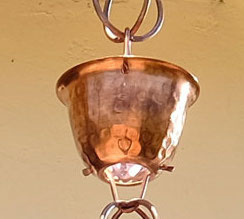 RainChainsStore.com is a Vermont based company owned and operated by eco-friendly partners. We encourage everyone to make an effort to employ the use of natural and raw materials as an alternative to man made products. Your purchase from RainChainsStore.com takes us one step closer to making this planet a safer and healthier place to live. 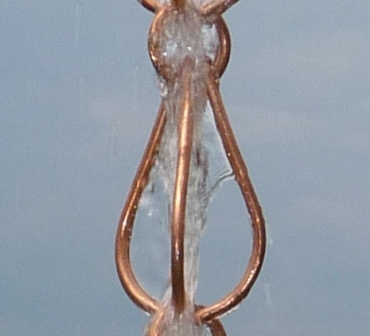 Rain chains are environmentally friendly and every home can be enhanced by adding 100% copper rain chains in place of downspouts. 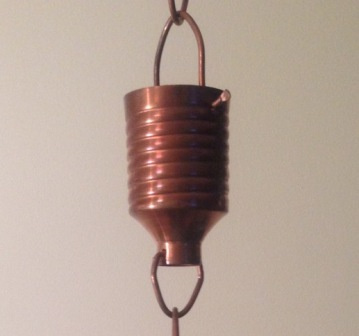 Q: What do I need to hang a rain chain? 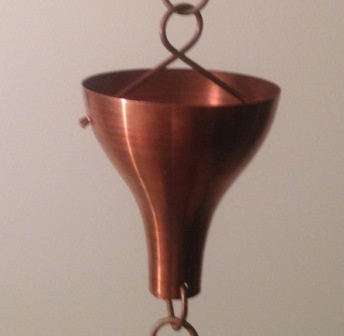 Our rain chains include a copper hanger designed to fit into an existing downspout outlet. 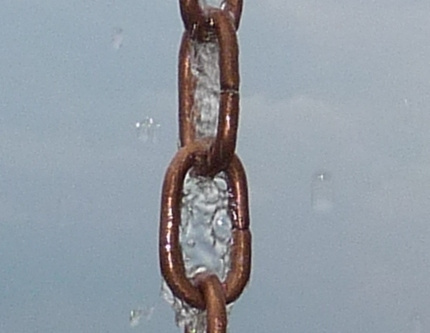 Rain Chains will not function correctly if attached to gutters with just a flush hole. 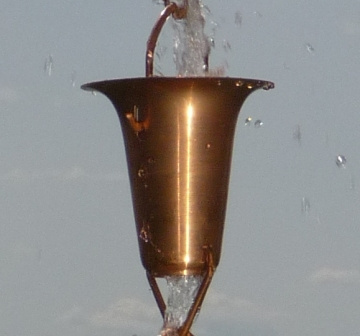 Water will shoot out in various directions and miss the rain chain. For new construction or a gutter with just a flush hole our gutter reducer is required or an outlet installed by your gutter supplier for the rain chain to function correctly. 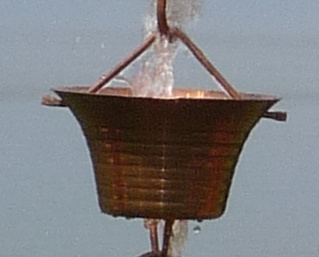 The reducer or outlet creates the vertical flow which is necessary to prevent water from missing the rain chain. 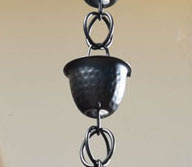 Q: Why are there different size (M, L, XL) rain chains? 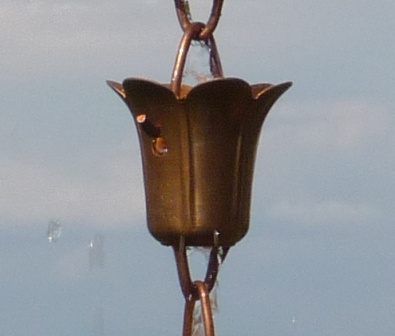 When replacing a downspout with a rain chain the diameter of the rain chain needs to be the same or preferably larger than the outlet opening. 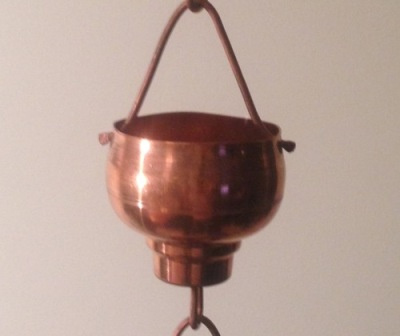 As an example, if your outlet opening is 3” choose a cup style that is 3.25” in diameter or larger. 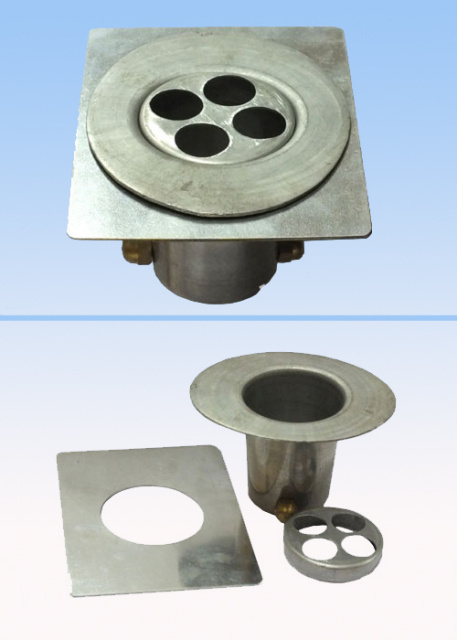 If you choose a link style then a 2” diameter is the maximum opening. 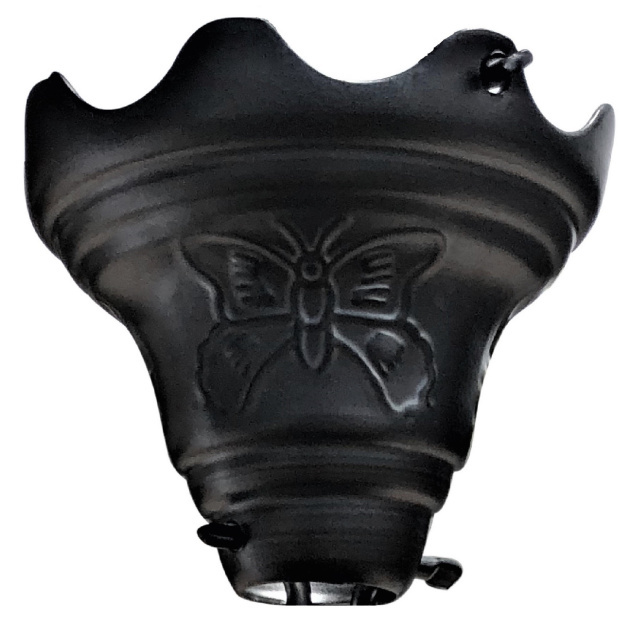 Our gutter reducer works with all of the rain chains and fits a round opening with a minimum of 2.75” up to a 4.5” diameter. If you do not have existing downspouts or are installing new gutters our gutter reducer is necessary for the rain chain to function properly. 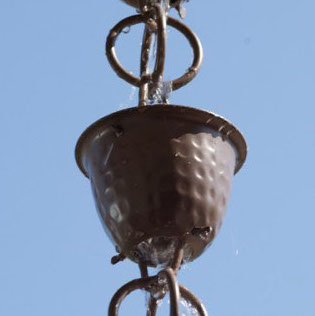 If you hang a rain chain directly to a flush hole in the gutter water will shoot in various directions and miss the rain chain. 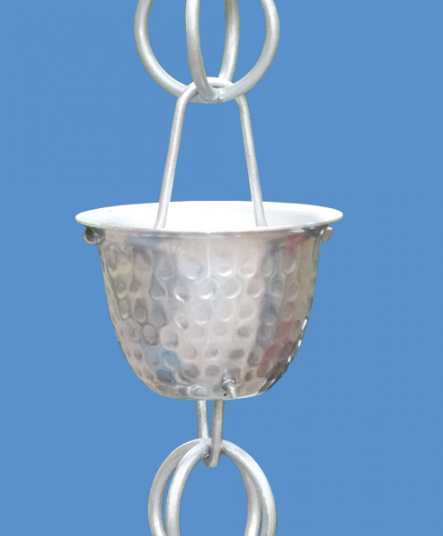 The gutter reducer assures all the water leaving the gutter flows into or onto the rain chain depending on which style you choose. Please note the gutter reducer works with all of our rain chains. Our Gutter Reducer accomodates all of our Rain Chains. However, it is not necessary for all applications. 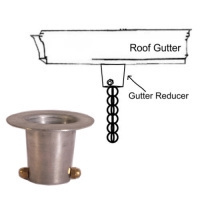 If your downspout outlet is larger than 2 3/4" I suggest you purchase the Gutter Reducer. 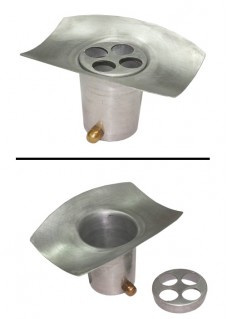 The top part (flange) of the Gutter Reducer can be trimmed. 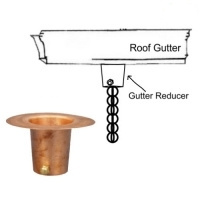 The Gutter Reducer can be found on all of our Rain Chain pages. Another example of needing a Gutter Reducer is, if your not going to use an existing downspout outlet and are going to put a hole in your gutter, you will need a Gutter Reducer. 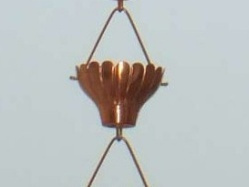 The top part (flange) of the Gutter Reducer can be trimmed. 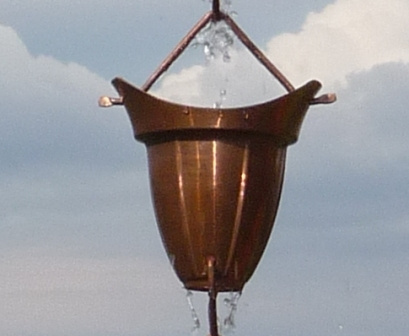 The Gutter Reducer can be found on all of our Rain Chain pages. 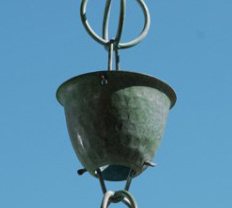 Q: Does it matter where I hang my rain chain? 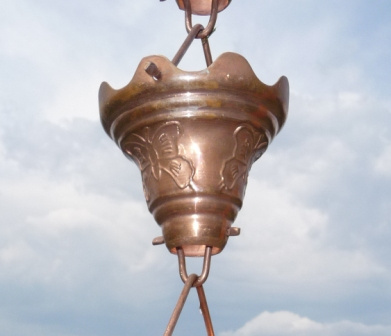 There are some factors to consider when deciding on the best location for your new home ornament. 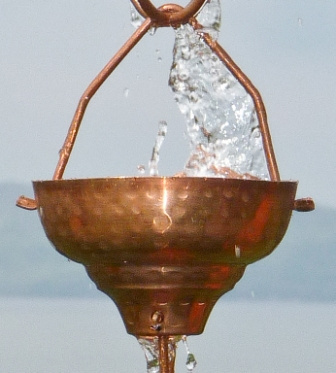 First, consider the effect of splashing. 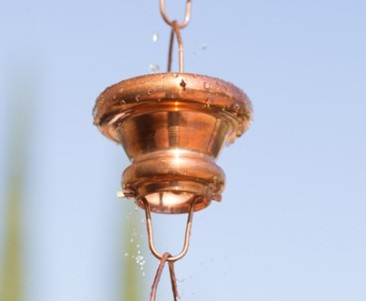 If hung too close to a walkway or porch, those passing by might find themselves getting a bit wet during a heavy rain. 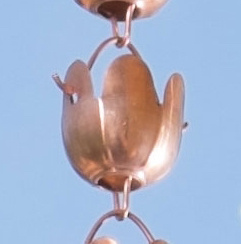 In general, the ones made of just the copper loops linked together tend to be the “splashiest” – for a location with foot traffic nearby, chain downspouts that use cups might be more appropriate. 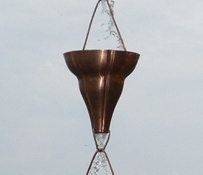 They can handle the flow of water more easily as it is funneled from the top to the bottom. Second, it’s nice to have a spot where it can be easily seen. If you have a window near where your gutter drains, that could be an ideal spot. This would allow you to “see the show” up close, but without getting wet. You might even be able to open the window a bit and enjoy the sound of the water as well. 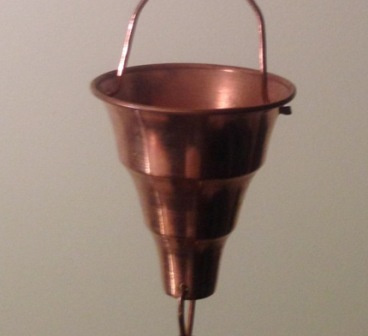 Q: What is the function of a Rain Chain? 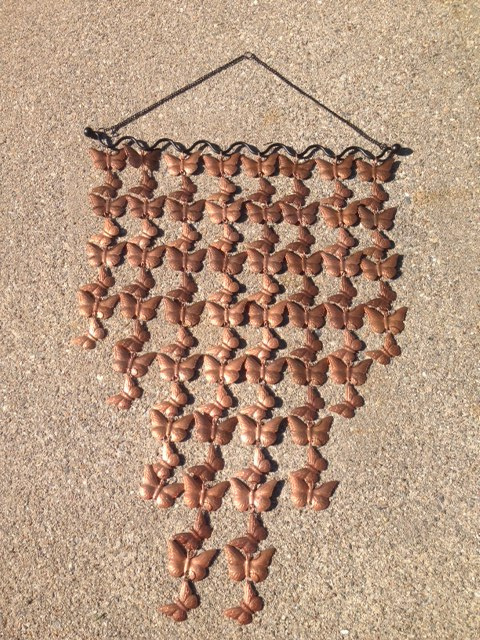 Rain Chains function like a downspout but are much more attractive than an ugly downspout. 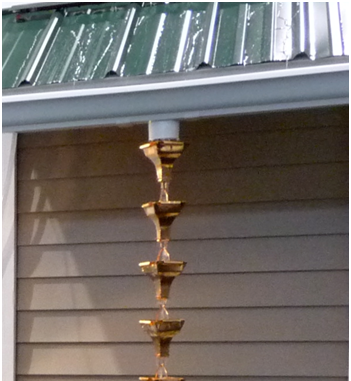 Like a downspout, rainchains allow a steady flow of water off of your roof from the raingutter. 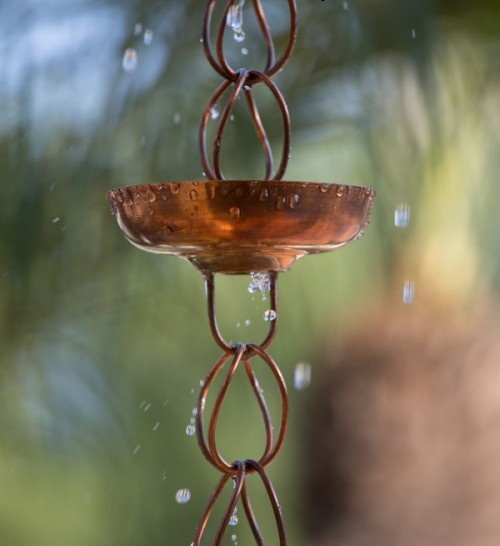 Unlike a downspout a Rain Chain allows you to watch the cascading water through the cups or links with the soothing sound of flowing water. 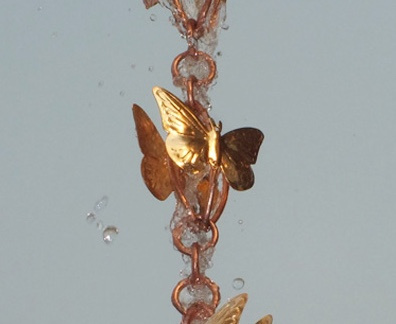 Q: How much do Rain Chains Weigh? 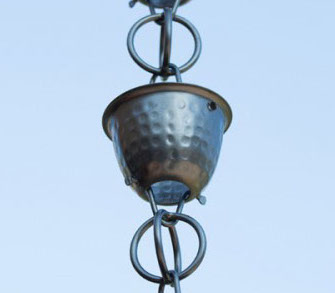 Our Rain Chains average between 4 - 7 lbs and are not an issue hanging from most raingutters. 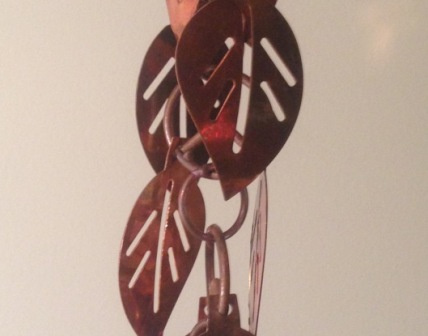 Q: Can you make your Rain Chain longer or shorter? Yes, this can be done easily. 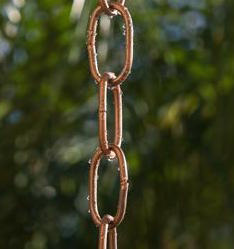 All our Rain Chains can be made longer or shorter but is something you do. All our rain chains come pre-packaged at 8.5 '. 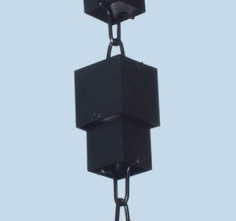 Many customers who have second and third story home have easily put 2 or 3 Rain Chains together. For example: If the footage needed between your existing outlet is 20', you would purchace 3 rain chains or 2 Rain Chains and a 3' extension. NOTE: (we have 3' extension for only 6 of our 30 styles). 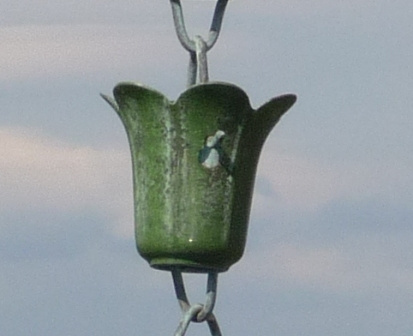 Q: Is it easy to install a Rain Chain? Yes, all Rain Chains come with instructions. I tell everyone it takes longer to get the ladder out of your garage than to hang a Rain Chain. 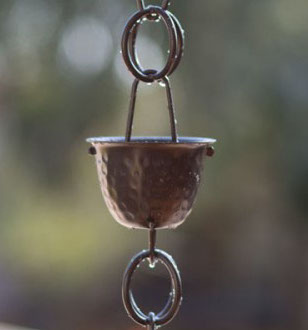 Q: Do I have to take down my Rain Chain in the winter? No. Many of our customers live in cold and snowy sections of the country and Rain Chains are very attractive when covered in snow. Please note, modified rain chains and heavy snow and ice may cause links to come apart damaging the rain chain. Rarely happens but has been know to occur and we cannot control mother nature and her weather. 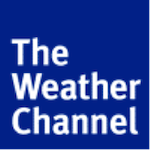 Q: Will high winds affect the Rain Chains? Rarely have we heard of any issues with wind. 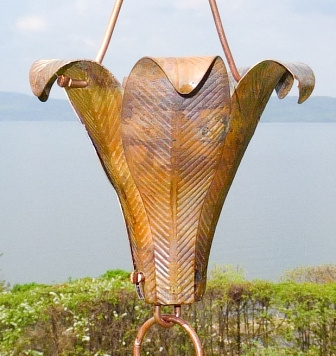 Due to the open design only a very strong wind will cause some swaying but it will be minimal and should not affect the function of the Rain Chain. 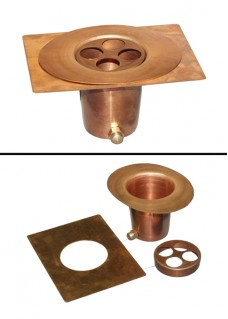 However, we offer 2 sizes in anchoring basins. 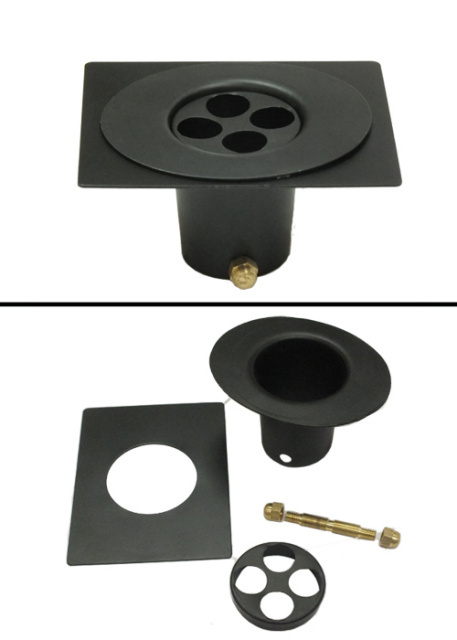 Each anchoring basin has a bolt system that easily attaches from the center of your basin to your Rain Chain from a 12" link. 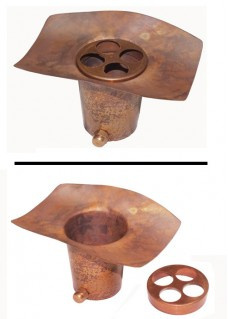 Q: What is the difference between the cup and link style? 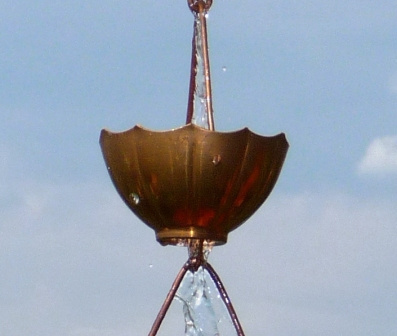 The cup style concentrates the flow of water and during heavy rains will contain water moreso than link styles. 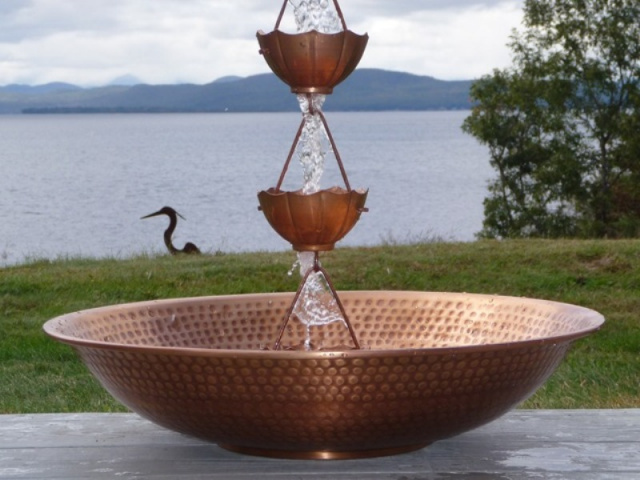 Both are functional and attractive with water flowing through them. 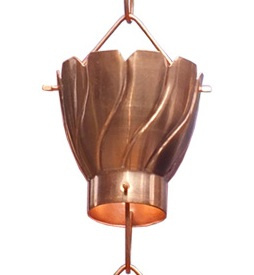 Cup styles are easier to shorten or lengthen because the cups can easily be removed or added where the link may require soldering. 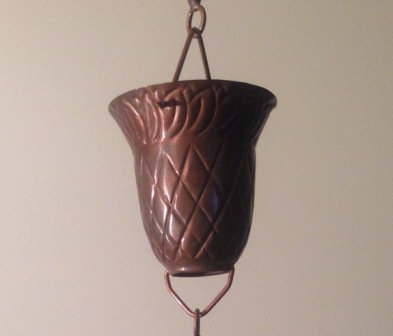 Q: Will my Rain Chain maintain its shiny copper appearance? 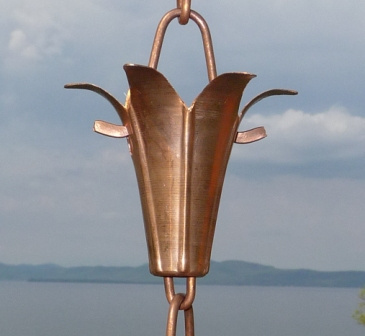 Our Rain Chains are made from 100% copper which through normal usage will darken with age and develop a beautiful patina finish. 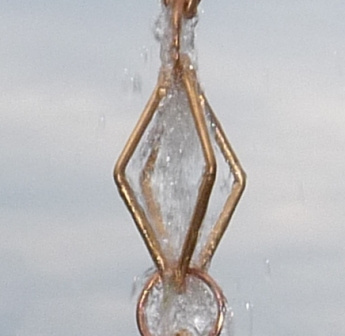 Our Rain Chains will last many years. 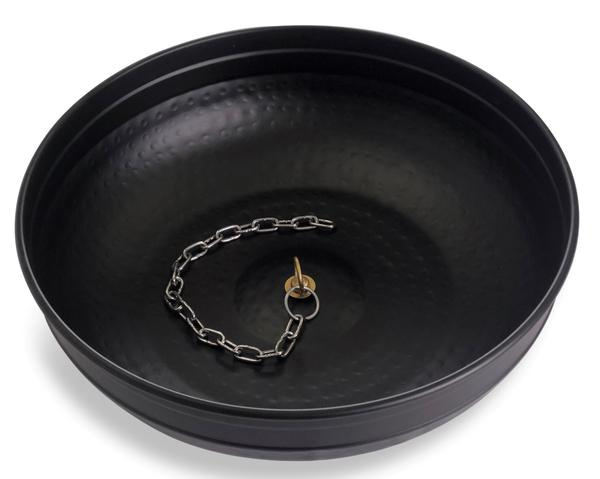 Q: How long does shipping take for Rain Chains? We ship FedEx Ground (Canada and Hawaii orders are shipped USPS). 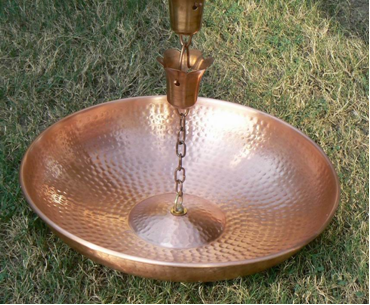 In most cases we ship Rain Chains and basins the same day as we receive your order. PLEASE NOTE: Any orders that require special shipping such as 2 DAY, or NEXT DAY must be received by 1:00 PM (EST). If not received by 1:00 PM (EST), the order ships the following business day. You may return an item for refund or replacement within 30 days of the shipment date. Product cannot be used. All returns are subject to a 15% re-stocking fee. Shipping charges are non-refundable. All returns must be called in or emailed and accompanied by a RA# which is provided by us via email. You may want to insure your return; we cannot be responsible for lost or misdirected returns. If you paid for your order by credit card, a refund will be issued and appear on your billing statement. Use our secure online Shopping Cart to order products or call us: 800-372-3319 All payments will appear on your credit card statement as "Rainchains" You will receive a confirmation email when you submit your order, then a separate email when the order is shipped with FedEx information and a tracking number. We guarantee our products for a period of one year from the date of purchase. If, for any reason, a product breaks or fails due to a manufacturing flaw we'll either repair or send you a replacement.